The 163rd University Boat Race is expected to go ahead as planned despite a suspected World War Two shell being discovered by the River Thames. Race organisers said they were setting up for the event later this afternoon. They expect to receive an official update from the Met Police as to the status of the shell at 13:00 BST. The shell was discovered on the northern shore of the Thames near Putney Bridge, west London, on Saturday. The police said work to assess what is believed to be "submerged ordnance" is continuing on Sunday morning. A bomb disposal unit had to wait for the tide to go out to take a better look at it, police said. The Thames river tide receded at about 01:00 BST. Crowds of up to 300,000 people are expected to line the banks of the River Thames. It is still possible some viewing areas may have to be suspended if the shell is deemed to pose a hazard, but event organisers said they have not been advised to do this as yet. Metropolitan Police Ch Insp Tracy Stephenson said: "Our specialist experts are dealing with the suspected WWII ordnance. We have been working very closely with the organisers of the boat race to plan this event which is eagerly awaited by spectators and supporters alike. At this stage, the races will go ahead as planned." Spectators have been warned to be vigilant following the attack at Westminster, reported the Telegraph. "The security threat level remains at severe and, as always, we would encourage those attending to be aware of their surroundings and be vigilant," the Met said in a statement. Roads in the area of the suspected bomb currently remain open. The Met confirmed officers were in attendance on the northern bank of the river at Chelsea. In an earlier statement the Met said: "Police were called by a member of the public at approximately 13:50 BST on Saturday... reporting what they thought to be World War Two ordnance on the Chelsea shoreline by Putney Bridge. "Officers including the Marine Policing Unit are in attendance." 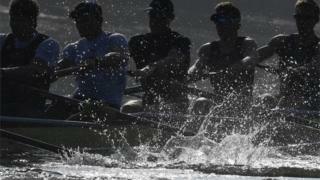 Michelle Dite, race director of the Boat Race, said on Saturday: "At this stage the races will go ahead as planned. "Any decisions regarding changes to the event will be made in conjunction with the police." The BBC understands the bomb was found by a passing sailor and was located on the Chelsea bank of the river on the north side of Putney Bridge. The races start on the other side of Putney Bridge, with the women's race at 16:35 BST and the men's race at 17:35 BST.